Since I’ve been converting all of my favorite recipes for my new favorite appliance , this week I made Instant Pot Broccoli Cheese Soup. Now I have another easy family dinner recipe and this one is perfect for Meatless Mondays. 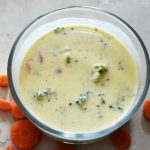 Broccoli cheese soup is one of my favorites and made in the Instant Pot, it’s fast and easy to throw together. 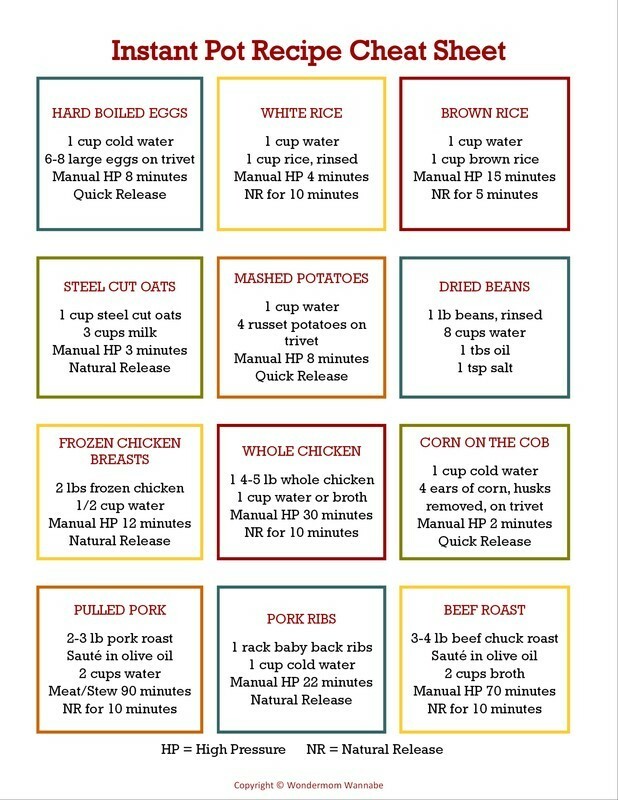 I just love recipes that work for busy weeknight dinners. I love cooking in the Instant Pot because it makes dinner so fast and easy (and cuts down on the number of dirty dishes!). This recipe is no different. It’s a one-pot meal you can make in 3 simple steps. 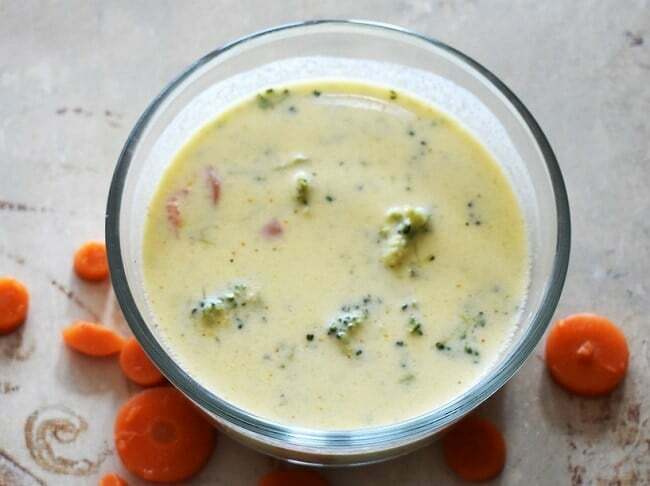 Put all the ingredients EXCEPT THE MILK in the Instant Pot – broccoli, carrots, cheese, broth, water, garlic powder and seasoned salt. Use soup function on Instant Pot and set for 5 minutes. Quick release the pressure and stir in the milk. Your soup is ready to serve! 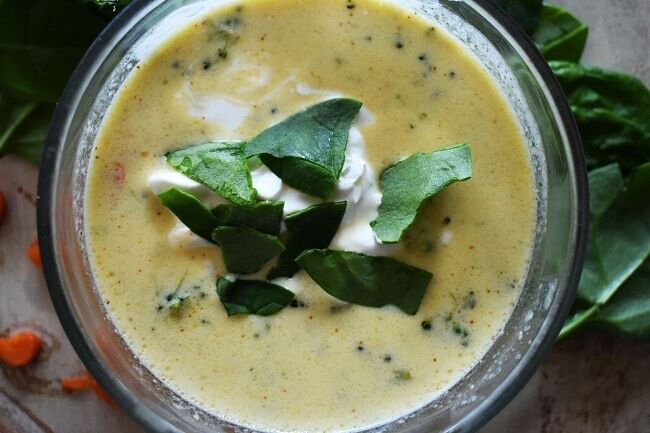 For added color, you can top with an optional garnish of sour cream and fresh spinach leaves. Combine the defrosted broccoli, carrots, cheese, chicken broth, water, garlic powder, and seasoned salt in the Instant Pot. Press soup function on Instant pot and set timer for 5 minutes. By the time soup has reached temperature soup will be half done. Please note Instant Pot will take several minutes to reach temperature. Be sure that steam function is on sealing setting. Quick release and immediately stir in the milk. Garnish with sour cream and spinach (optional). Also milk and cheese should be added at the end. Use fresh broccoli too. Thanks for the tips Suzanne! Preshredded cheese contains cellulose powder and creates the grainy lumpy look. Always use fresh grated cheese. I made it. Nothing curdled! I used heavy whipping cream instead of milk because I’m on Keto. Is the salt amount correct? 2 tablespoons? That seemed like a lot so I cut in half and still is WAY too salty. Other than that it’s great! I’m glad yours turned out. 2 tablespoons?! I thought you must have read it incorrectly since that would be WAY too much and when I checked, I see that is what I had! Not sure if I typed it wrong initially or if my recipe card converted it incorrectly when I switched to the new one a few months ago. Thanks for catching it. Changing it back to teaspoons (what it should have been). I made this yesterday and had the same issue with the cheese curdling, even when adding the milk last. I think as others commented, next time I will add both the cheese and the milk after I quick release. The soup still tasted fine, it was just a bit chewy with all the globs of cheese in there! Hi Rachel, thanks so much for the feedback. I’m not always able tor recreate the same problems so it’s really helpful to have readers share their experiences with the recipe. Thank you! No problem! I’ll update once I try again with adding cheese last. My husband was VERY pleased with the overall taste of the soup though, he just said it looked weird ? I always like to add chicken and rice to my broccoli cheese soup. Any ideas on how to add those? You’d have to cook them separately and add them at the end. Both rice and chicken need more time to cook than the broccoli and if you cook the broccoli longer, it will get too mushy. That dish sounds delicious! I was excited to try this recipe since my kids love broccoli cheese soup and I was excited to see this was made with no flour/thickening agent (I’m on a keto diet). Unfortunately as I suspected though, this does need either flour or corn starch (I ended up adding about two tablespoons after cooking) because there’s no thickness to the soup at all- and no way my kids will be interested without it. I would also highly recommend adding both the cheese and the milk after the pressure cooking. I didn’t have the issue someone else reported of the cheese sticking to the bottom (my cheese was added last as suggested). And the cheese “mostly” didn’t curdle… but it did curdle to/around the broccoli. Which I’m afraid may gross out my kiddos (time will tell- they’re still at school right now). Otherwise the base of the recipe is great and I really appreciate it since i’m brand new to pressure cooking. I would do it again adding the cheese and milk after cooking, as well as an additional 1/2 teaspoon salt, 1/2 teaspoon pepper and 1 teaspoon paprika. Thank you so much for your feedback and suggestions! I’m going to try a new batch with your suggestions and update the recipe if the end result is good. My cheese burnt to the bottom, twice! (Ooops!) So this was my first attempt using my new Instapot thus I take full responsibility for my shortcomings! I’ve read that mixing may have been my problem, true? Should have left the cheese on top? Help!!?? P.s. I salvaged the soup regardless and was disappointed in my grocery store baguette, I’m spoiled by Panera’s crunchy chewy deliciousness! Oh no! I’m glad you salvaged it (and I hear you about being spoiled by Panera’s amazing baguettes). I don’t mix the ingredients, just pour them directly into the pot in the order they’re listed in the recipe. I’ve had someone else write to me and tell me they stir the cheese in with the milk AFTER the soup has cooked. It will be plenty hot enough to melt the cheese. If you don’t want to risk scorching, this might be the way to try it next round. If you do, come back and let me know so I can add those notes to the recipe for others. I’m trying this one tonight! 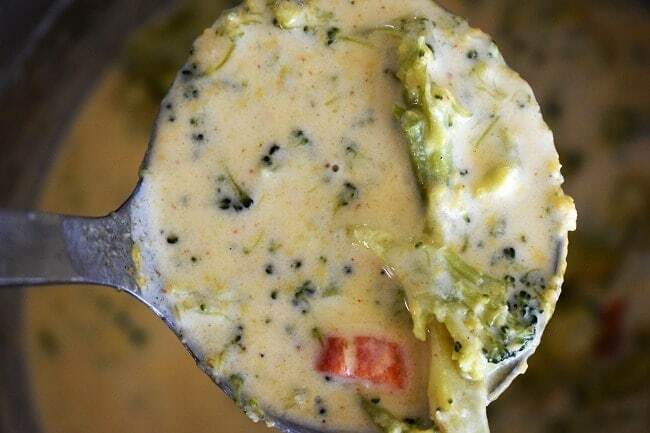 When I make broccoli cheese soup on the stovetop I always stir in the cheese and milk after the stock and broccoli is made, perhaps those having curdling trouble should add the cheese at the same time they add the milk? The curdling was happening when I had the milk earlier in the recipe. After I made it clear to add it after the other ingredients cooked, I haven’t had anyone else complain about the problem. It’s so much cheese, I don’t know that it will all melt to the right consistency if you add it all with the milk at the end. I’m curious to know if it works for you. Please let me know how yours turns out. Hi Alane, I use the Kraft Shredded Four Cheese Blend. It has a blend of cheddar and monterey jack cheeses. I also had a curdling problem with the recipe how it was originally written – I saw the edit below, but the first step still lists the milk. I’d planned to wait to add the milk but had everything laid out and was just pouring stuff in and missed it. I realized as soon as I added it what I’d done and sure enough it curdled and was really runny; so much so it spit out of the release valve! Please edit the first step so no one else makes the same mistake I did! Had to pour the whole thing out. On a side note, both times I’ve tried to make versions of this soup in the instant pot it’s curdled despite using very different recipes and methods. Does anyone have a trick or am I doing something wrong in addition to the above? Thanks for sharing your input Erin. I’ve adjusted the instructions to make it clear to add the milk at the end (both in the post and in the recipe card). I’m so sorry you had a wasted batch! In the Instant Pot community on Facebook, many others have reported similar problems with a variety of recipes for this soup. I wish I had a better answer for you as to why it turns out for some and not for others. I followed this recipe to a tee and the cheese looked curdled and it was very watery. What did I do wrong? Oh no! Another blogger told me her soup does this too so she adds the milk after a quick release. I’m going to adjust the recipe right now to make that change. I’m sending you a separate e-mail too so please check your inbox for an e-mail from me.